Rev. John K. Reimer, 2006. Source: EMC Archives, Steinbach Manitoba. Leona Reimer, wife of Rev. John K. Reimer. John K. Reimer, EMC missionary, pastor, and administrator; born 18 February 1919, to Isaac W and Margaretha (Kroeker) Reimer, the 11th of 17 children. John married Leona Ruth Reimer (15 September 1925-14 December 2011)on Thanksgiving Day, 8 October 1945. Leona was born in Île-des-Chênes, Manitoba, to Peter D. and Maria (Friesen) Reimer, the eldest of 11 children, eight sisters and two brothers. John and Leona had five children: David, Samuel Wayne, Lucille, Rod, and Arvella. Rev. John K. Reimer died on 3 November 2016, at age 97, at Bethesda Hospital in Steinbach, Manitoba, only a few miles from where his life began. John Reimer’s childhood and youth were spent working hard on the family farm in the Steinbach area. As a young man he dedicated his life to serving God. In 1941 he objected to military service. He attended Steinbach Bible Institute in preparation for Chrisitan ministry, graduating in 1943. He was one of the first young people from the Kleine Gemeinde Church (later Steinbach EMC) to go to Bible School. John and Leona Reimer served the Lord in various places in Canada as well as internationally. Rev. 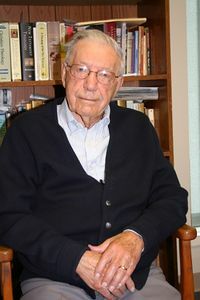 John K. Reimer lived so long that a generation of people exists unaware of his significant ministry within the EM Conference. He held many pioneer positions in the Conference. John K. and Leona were the first church-supported missionaries with Western Gospel Mission in the Danbury-Weekes, Saskatchewan area, serving with the mission from 1946-1955. He is remembered for the passion for his work in public schools, in evangelism, and in establishing churches. John K. Reimer was ordained as a minister in 1950. He served as a pastor in the first EMC church in Winnipeg (Aberdeen EMC) from 1955-1964. He was an inspiring pastor with a vision for outreach in the poorer areas of the city, and he encouraged his church to be involved in the church’s outreach known as Euclid Mission. From 1964-1969 he served as the pastor of Emmanuel Mennonite Church in Meade, Kansas, an unaffliated Mennonite congregations with Kleinegemeinde roots. He was an EMC Board of Missions member from 1959-1964, and was known to be an encouraging member. When the Board of Missions decided to hire an executive secretary to do the administrative work, he served in that position from July 1964 until April 1977. He was remembered as relating to missionaries in a caring, thoughtful manner. Rev. Reimer later served as a pastor at Wymark EMC, Saskatchewan (1977-1985); in Tres Palmas, Paraguay (1985-1986); and as an interim pastor at Anola Fellowship Chapel (1987-1988). After that, he served as a deacon at Steinbach EMC (1989-1994); and the EMC Yearbooks list him as one of its ministers. Rev. Reimer is remembered as a faithful, caring, thoughtful, hardworking person. His wife Leona was a friendly gem of a person. Pete Hanchar, a former resident of the Danbury-Weeks area in Saskatchewan told of how he and Rev. Reimer went fishing. Pete was eating raw garlic, the smell of which was too much for Rev. Reimer. Pete suggested it would help if he ate some. Pete was right, but when Rev. Reimer went home he had to sleep on the couch. The funeral services for Leona and John K. Reimer were held at the Steinbach EMC with the interment at Heritage Cemetery, Steinbach, Manitoba. Fittingly, donations were accepted for the EMC Board of Missions. Klassen, Henry. “Rev. John K. Reimer (1919-2016): A Tribute.” The Messenger (May 2017): 31. 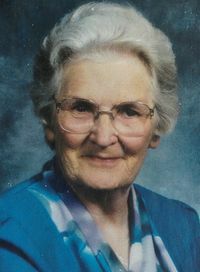 “Leona Reimer, 1925-2011.” Birchwood Funeral Chapel obituary (accessed 31 July 2017). “Rev. John K. Reimer, 1919-2016.” The Messenger (March 2017): 32. Smith, Terry. "Reimer, John K. (1919-2016)." Global Anabaptist Mennonite Encyclopedia Online. July 2017. Web. 26 Apr 2019. http://gameo.org/index.php?title=Reimer,_John_K._(1919-2016)&oldid=162330. Smith, Terry. (July 2017). Reimer, John K. (1919-2016). Global Anabaptist Mennonite Encyclopedia Online. Retrieved 26 April 2019, from http://gameo.org/index.php?title=Reimer,_John_K._(1919-2016)&oldid=162330. This page was last modified on 2 November 2018, at 20:32.